Since 1954, [Eisenberg] has made nearly 200 overseas trips, purchasing many thousands of works of art for tens of millions of dollars. This aggressive purchasing policy, perhaps without parallel in the field, enables us to offer an extraordinary number of choice objects at very reasonable prices. Italy has been aggressively seeking the return of looted antiquities it says were smuggled out of the country and sold to top museums and collectors worldwide. Eisenberg has clearly changed his position since his comments that the Italian attempts to restrict the movement of cultural artefacts to the USA were "absurd" and "oversimplified" (Guy Gugliotta, "Policing Plunder, Italy Requests U.S. Help in Stemming Loss of Its Antiquities", Washington Post, October 11, 1999 [archived]). 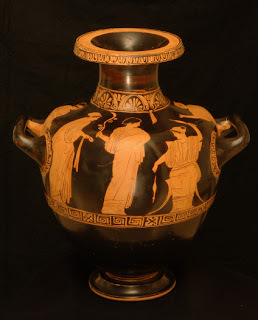 Among the antiquities returned to Italy by the Museum of Fine Arts in Boston in 2006 were two Apulian pots sold by Eisenberg. The loutrophoros (1988.431; cat. no. 69), attributed to the White Sakkos painter, had been acquired at Sotheby's in London (10 December 1984, lot 366). The second was a bell-krater (1988.532; cat. no. 15), attributed to the Hoppin painter, that had been purchased from Palladion, Antike Kunst of Basel (1976). None of these are monumental works of art, and what fuss are [Italian audiences] going to make about this vase? ... Far more people will see it at the MFA. The printout showed that this company, Christian Boursaud, consigned for sale in the July 1985 auction some 104 unprovenanced antiquities. in the December 1987 sale which consisted of 360 lots, 101 were sent in by Editions Services. Once again, none of these antiquities had any provenance and again the shipment included twelve Apulian vases. What other items purchased at these sales at Sotheby's will be pursued by the Italian authorities? Though I have never purchased an antiquity in Greece, nor in Italy since 1971, nor in Egypt since 1966, I am perhaps, unfortunately, at the same time, a hypocrite, since I have no doubt unknowingly bought a number of objects legally from galleries and auction houses throughout Europe, especially in England, that might have once been exported illegally from their country of origin. Eisenberg, J. M. 1995. "Ethics and the antiquity trade." In Antiquities trade or betrayed: legal, ethical and conservation issues, edited by K. W. Tubb, pp. 215-21. London: Archetype. Gill, D. W. J. 1997. "Sotheby’s, sleaze and subterfuge: inside the antiquities trade." Antiquity 71: 468-71. —. 2007. "From Malibu to Rome: further developments on the return of antiquities." International Journal of Cultural Property 14: 205-40. Watson, P. 1997. Sotheby's, the inside story. London: Bloomsbury.